When Sylvia Hatchell was inducted in the Naismith Basketball Hall of Fame in 2013, her Hatchell Heels were there for the journey into history. N.C. State Basketball Head Coach Kellie Harper Becomes the First Female Coach to Launch Her Own High Heel Collection. 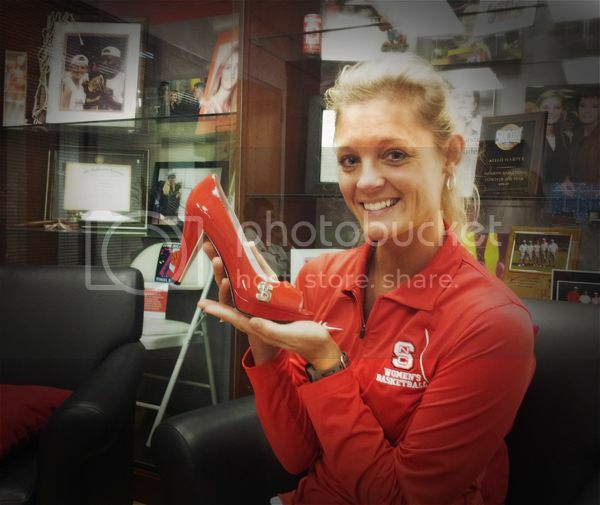 Come this Fall Kellie Harper, North Carolina State University's Head Women's Basketball Coach, will be stomping her ACC competition in her own signature line of Wolfpack Heels by Fan Feet. Coach Harper will be the first female coach EVER to rock her own collection of high heels. Coach Harper has long been known for her impeccable taste in heels, so when the the chance came to partner with Raleigh-based Fan Feet to do her own line, it was a perfect fit. This Fall the Kellie Harper Collection will add an elegant set of classic closed-toe heels, one in State Red with a black heel and the other black with a red heel. Both will showcase Fan Feet's well known chrome hardware accent featuring NC State's trademark. Coach Harper has already been hitting various events sporting the Madita Style Peep Toe in both the Cardiac Red and Cardiac Black (right) Styles. Fan Feet Lead Designer Demian Dellinger says: "It is such a pleasure and honor to work with Coach Harper and the Women's Basketball Staff, they are a class act all around. N.C. State is without question one of the top public universities in the world and, having myself grown up in Raleigh, it means a lot to have the opportunity to design for and showcase a school with top-notch athletic and academic programs." About Fan Feet: Fan Feet is committed not just to making the most stylish and hottest College Heels for the school faithful, but also to supporting higher educational opportunities for America's youth, local student organizations & causes and supporting women's athletic teams at both the high school and college levels. Fan Feet strives to go above and beyond, working with local organizations to support great opportunities to make YOUR hot College High Heel purchase do the most good for YOUR school and school community. Copyright 2012. All Rights Reserved. Patents Pending.